TCO Certification may be used as evidence of Continuing Professional Education, including when a professional association requires an examination. The number of CPE credits earned, often called Continuing Education Units (CEUs), are listed below. Every state or provincial association for every profession can define requirements and criteria for Continuing Professional Education. Since these associations numbers in the hundreds, it is not practical - perhaps impossible - for TCO certification and/or the underlying training courses to be accredited by every one of these associations. However, many associations do not pre-approve CPE programs, instead referring to the American Institute of Certified Public Accountants (AICPA) and the National Association of State Boards of Accountancy (NASBA) criteria for CPE programs and CPE credits. These criteria are reasonable and could be applied to any state and any profession. The AICPA-NASBA Standards For Continuing Professional Education (CPE) Programs measure CPE credits in "contact hours" and define standards for calculating the number of contact hours corresponding to a training course. In most cases, it is the training course, not the certification, that is the basis for the CPE credits, and the number of contact hour CPE credits will be calculated by the training course provider. 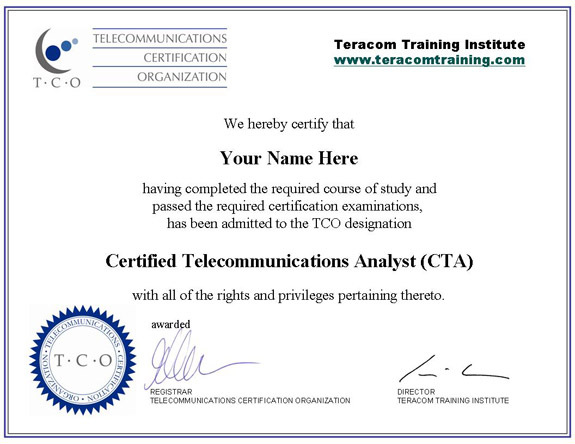 For example, our training partner Teracom Training Institute lists CPE credits here. Please note that a particular state association may not accept TCO Certification or a training partner's courses for CPE credits / CEUs. Further, if in the unlikely event that any work is required to prepare documentation to support a claim for CPE credits for a particular association, that work is the responsibility of the student.